When Disney’s Animal Kingdom was announced, then known as Disney’s Wild Animal Kingdom, there was an immediate, and mass, outpouring of enthusiasm and interest in what the park would be and do. Perhaps guests were simply more organized, as Disney’s Animal Kingdom was the first park to open under the global community of the internet, or perhaps it seemed like a departure for Disney and therefore sparked a more insatiable interest. 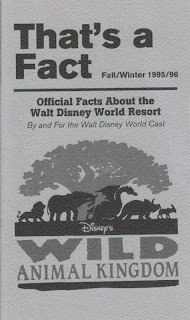 Whatever the case may have been, Walt Disney World attempted to keep its Cast Members up to date on facts and figures that they could share with guests. 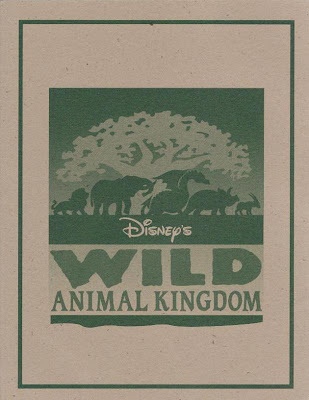 Disney’s Wild Animal Kingdom information was made available through portable note cards and was even featured in the small That’s a Fact booklets for Cast Members. 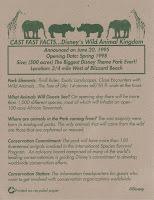 Statistics provided in these materials included specifics on location, announcement dates, opening dates, size, animal population, and the park’s commitment to conservation. After being rebranded as the shorter Disney’s Animal Kingdom, the opening date began to creep up on the park. 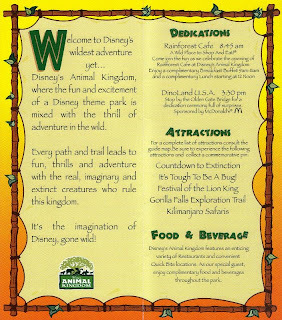 As with most other parks, not every dedication and opening took place on the park’s opening day, April 22, 1998. In fact, while Asia was still almost a year away, pieces of the park were actually dedicated during the Grand Opening Celebration a day early on April 21, 1998 during press events. The history of this magnificent park goes well beyond the eleven years it has been open, even beyond the fourteen years since it was announced. One would be entirely justified in believing that Disney’s Animal Kingdom was given its first breath of life by Walt Disney himself and his love and commitment to animals the world over. Taking a look back at the documents that were produced over the few scant years between the park’s announcement and opening is a terrific joy, but, in the end, it hardly tells the whole story of the youngest Florida park sibling. A fantastic read - Happy Birthday Animal Kingdom! And thank goodness they dropped the 'Wild' - although DWAK would have been fun to write! Walt himself building if given the chance. Again, I'm just going on what I've read and heard about Walt and could be totally wrong. But I'd like to think not.